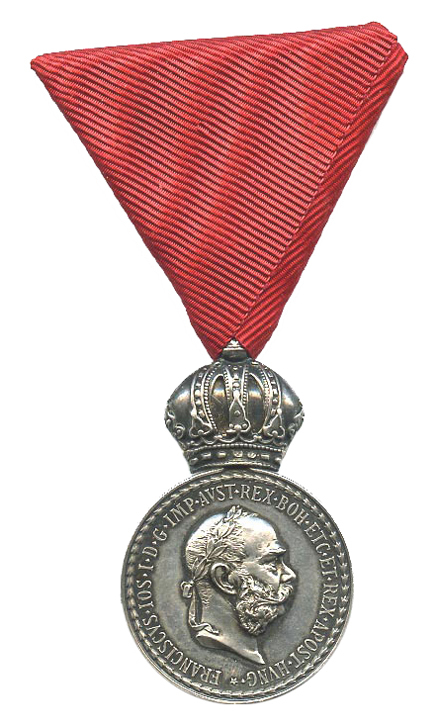 Figure 1: Silver Military Merit Medal on civil ribbon. Image from the author’s archive. The Military Merit Medal (Militärverdienstmedaille), 1911-1917 is not at first glance a very important looking decoration. However to the Austrian officer corps and to the empire it was a decoration of substantial significance. This can be recognized when one considers that in the order of precedence of Austrian awards it preceded the Gold Bravery Medal and that until the second year of World War I all awards were personally presented by the Emperor. In fact this decoration was roughly the equivalent to the American Distinguished Service Medal in regard to the esteem with which its recipients were held within the empire. What follows is part 1 of the discussion of this significant award in which I will review the medal numismatics including date of issue, reason for the award of this decoration, classes and types, interesting facts, hallmarks, design weight, size, type of material and variations. Reason Issued: To recognize extraordinary service in time of war or outstanding service in peace time by officers and military officials of an equivalent rank. Classes or Types: This decoration was issued in two classes and three types. 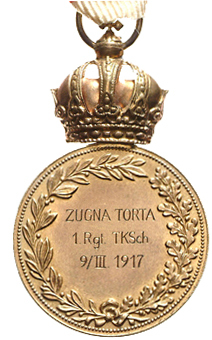 The bronze medal was to be returned when the silver medal was received assuming they were on the same ribbon. This requirement was later rescinded. 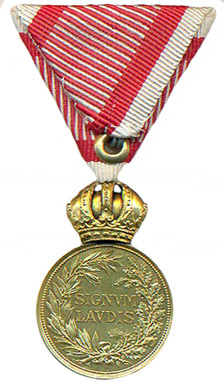 Design: A round medal with a raised rim and an attached hinged crown at the top. Figure 2: Bronze Military Merit Medal on war ribbon. Image from the author’s archive. 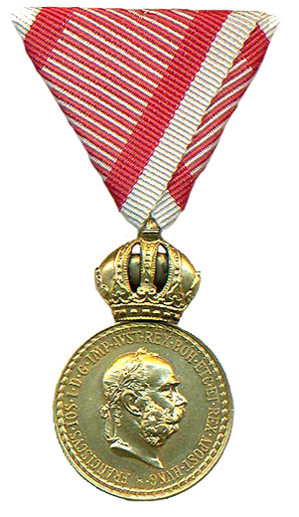 Figure 3: Silver Military Merit Medal obverse on war ribbon. Image courtesy of Dorotheum. Obverse: A bust of the old Emperor Franz Joseph I in high relief facing right. In his hair is a wreath of laurel. Around the bust is inscribed: FRANCISCVS . IOS . I. D. G. IMP. AVST. REX. BOH. ETC. ET. REX. APOST. HVNG . The beginning and end of the inscription is at the bottom of the medal and is separated by a star. Outside of the inscription along the edge of the medal is a wreath composed of 62 laurel leaves. The attached crown is usually hollow with a metal bonnet inside. The crown articulates with the medal and is moveable. Figure 4: Bronze Military Merit Medal, Reverse on war ribbon. Image from the author’s archive. Reverse: Within a wreath composed of 37 laurel leaves (left) and 25 oak leaves on the right and which is tied at the bottom with a bow is inscribed, SIGNVM LAVDIS (A token of esteem). The reverse of the crown is fully detailed. Size: The decoration without crown is 30-32 mm in diameter. The crown is 20 mm high and 19 mm wide. Thus the overall height of the medal is 50-52 mm. Figure 5: Bronze Military Merit Medal, Reverse with inscription on war ribbon. Image from the author’s archive. 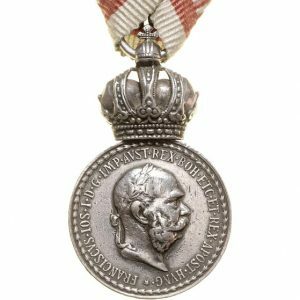 Silver Medal Type II: has a diameter of 31-32 mm and with an obverse portrait of the Emperor that is flatter and less well defined.